Celebrant starting Des's wedding vows. Clive and Shane run up and tell them the wedding can't go on – there's nothing wrong with Des's arm, it was just a joke! Paul tells Daphne they were all a bit drunk at the buck's night and they put Des's arm in plaster. Zoe leaves after her shift and tells her she's glad Daphne didn't get married with the celebrant. 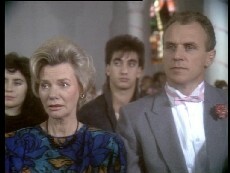 Daphne agrees – now they can have a decent wedding. Daphne's granddad comes in unexpectedly and Daphne is very pleased to see him – he's come to give her away at the wedding. 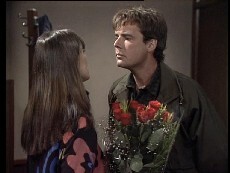 Daphne hesitantly tells him that Clive has agreed to give her away already. Granddad is OK with this – he just wants to come to the wedding. Zoe is talking to Paul about Daphne's wedding. 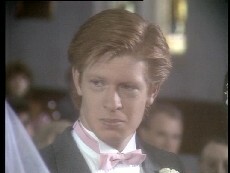 He implies that she only wants Daphne to have a proper wedding so that she can be a bridesmaid! She accuses him of thinking she is silly and impulsive, but he assures her he doesn't think that of her anymore. Paul says what happened between Zoe and his father made him think, but before he can elaborate, a man comes in with some flowers for Zoe. Zoe introduces Paul to Tony, an ex-boyfriend of hers. Paul says maybe he's come back to give it another go with Zoe(!). Tony thinks this is a good idea! When Paul has gone Zoe tells Tony that she can't figure Paul out – sometimes he's friendly, sometimes he's stand-offish. Mrs Mangel comes in and is surprised to see Des and Daphne. Clive bets Daphne's granddad that he can't sell something to Mrs. Mangel (he's a salesman). Des and Daphne tell Mrs Mangel that the wedding has been moved to tomorrow. She says it doesn't make any difference seeing as she wasn't invited anyway(!). Daphne's grandfather flatters Mrs.Mangel and invites her to Daphne's wedding as his guest! Des and Clive look on in awe(!). She insists there must be no scandal though as she is a married woman! Madge is decorating Daphne's wedding cake and Helen is watching. Daphne is very pleased with the professional job that Madge has done. Clive has a military-like plan for the day of the wedding and hands out instruction sheets to Madge, Helen and Zoe! Clive is dressed up for the wedding. He gives Daphne a necklace. Zoe comes in wearing a face-mask saying it's chaos over at Des's. Clive assures them that his fool-proof schedule is designed for fools so Des and Paul should be fine with it(!). 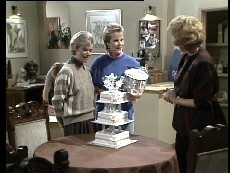 Daphne tells Zoe that Mrs.Mangel is invited to the wedding. Shane, Paul and Daphne's granddad are dressed up for the wedding. Jim and Tom Ramsay come in, also dressed up. 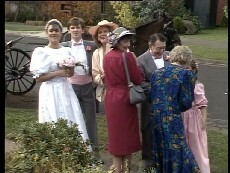 Then Mrs Mangel comes in dressed in a red dress. She tells Daphne's granddad to call her Nellie! The others try not to laugh. Des comes in – he is ready to go. Daphne is dressed in her wedding dress. Lucy tells Daphne that she looks like Cinderella. Zoe asks if that makes her one of the sisters! Before they leave Daphne and Clive have a quiet moment and then he escorts her out of the house. Daphne comes out of the house with Clive and they all admire her and her dress. Mrs Mangel says she's quite pretty when she's wearing some decent clothes(!). They get into the carriage and accompanying cars and leave for the Church. 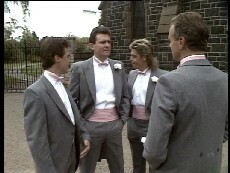 Des, Shane, Paul and Jim are outside the church. Des is nervous. 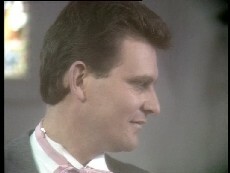 Tony comes up and Paul tells Jim that he's an old flame of Zoe's. He doesn't look too pleased. Shane tells Des he's glad they're still friends after all that's happened with Daphne. The horse and carriage approaches the church. 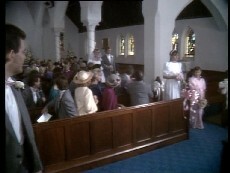 The organ plays and Daphne walks down the aisle on Clive's arm. 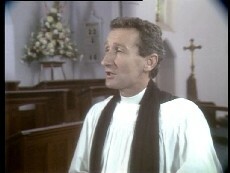 The minister starts the service. Des is surprised that Daphne's middle name is Rose – but he can't talk because his middle name is Kingsley! Des and Daphne make their vows.